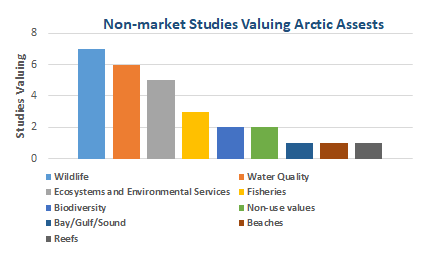 The Arctic ocean and coastal areas provide much more economic value than the commercial products and services that are estimated on our website. Natural resources that are not traded in the market place also carry values that are often overlooked when development decisions are made. Some of these values are environmental assets and services which might protect communities; others contribute to spawning grounds for fisheries or habitats for marine mammals that ultimately find their way into the marketplace. Others reflect poor human use and practices and reflect costly losses such as current impacts of climate changes in the arctic which are eroding coastlines and forcing indigenous peoples to uproot centuries of cultural traditions and migrate to less vulnerable areas to begin again. Overfishing, polluted waters and the melting of the tundra on land are a few of the non-market costs that are too often overlooked and not incorporated into economic considerations. This Non-market site of the NOEP provides reliable studies carried out by experts that offer estimates for these important values. Without considering these values, important natural resources and recreational assets and services could be lost forever. In this unique and fragile part of our planet, these values are even more important than other places and need attention. This collection is specific to the Arctic, but has also been incorporated into the broader NOEP bibliographic non-market site as well. A notable feature is the relatively few studies that have been done in a place with such a rich natural resource base. We shall continue to update this site as more studies become available. Please note you can search by asset, geography, author, date of study, etc. And in most cases, you can access the study directly or through a link or an abstract we provide. For further explanation of non-market valuation studies and how to interpret their methodologies, please go to this place on our website where the larger collection sits. "What You Should Know (FAQs)"